While I'm not the biggest fan of cold weather, there is absolutely nothing more magical than Sweden during the holidays. It actually feels like you stepped right into a snow globe or the North Pole. Visiting Stockholm for the second time this year was even better than the last. When I visited in 2016, I arrived right as a huge snow storm decided to make an appearance. I was unprepared (no snow boots or proper clothing), traveling alone, and didn't have any service to help me find my way around the city. So imagine a very lost Sydney with glasses covered in snow, sopping wet boots, shivering her way through Stockholm. No, you definitely never want to be in that position. Brianna asked me if I'd tag along to Stockholm again and I could never turn down an adventure with her! Fortunately the weather was much kinder to us this time and it's always better to travel with a friend. Brianna and I just click and it's so easy & fun to be with her! After all, she's been my best friend since before we were born! The central and classic part of Stockholm is called Gamla Stan. I found it to be the most traditional image of Sweden. There's tons of shops to pop peruse through, cafes to get cozy in, and a few important sights. Royal Palace: During my first visit, I purchased a ticket to go through the Royal Palace. First off, the royal family is some of the most beautiful people I have ever seen in my life. They have some amazing genes in that family and I totally want in on it (sorry Andrew). Google a picture and I guarantee your jaw will drop. It was so fun walking through all the beautiful rooms in the palace. It's not quite Versailles, but it's pretty darn close. You can also view the changing of the guards outside the palace. If it's a cold day, I think popping into palace is a great way to spend an hour or two. Nobel Museum: Here's another great spot to pop into on a cold day. If you're into the history of the Nobel Prize and want to learn a bit about the famous people who have won this distinguished honor, you should definitely visit. Christmas Market: Right outside of the Nobel Museum is a beautiful Christmas Market. I walked through it last year and was so happy to see it again this year. It sums up the charm of Christmas markets and really gets you in the spirit. There's plenty of sweets to buy, as well as hot coco, mulled wine, coffee, and endless amounts of homemade gifts (ornaments, gnomes, soaps, mittens, scarves, etc.) It's basically torture to walk through a Christmas market when you know your one suitcase going home is already 20 pounds over the 50 pound limit. Skansen: This the world's oldest open-air market! It's about a 20-minute bus ride from Gamla Stan and so worth it. Tickets are about $15 per person and you feel like you've stepped back 500 years in time. They've maintained all the traditional Swedish homes and each cottage serves as a museum, so you can walk in and see a glass blowing presentation and buy the products. There are also cobblers, black smiths, bakers, book makers, and so much more. It's a bit annoying that you have to pay to get in, but I think it's a great way to spend a few hours in Stockholm. We lucked out and were there during Saint Lucia day celebrations which is a very important holiday for Sweden. There were tons of concerts, carolers, and bonfires going on throughout the market. There's also a Scandinavian petting zoo with cows, reindeer, bunny rabbits, and tons of other animals. It was definitely just for children, but Bri and I had a blast looking at the animals and warming up from the chilly outdoors. ABBA Museum: I grew up dancing around our kitchen and singing along to ABBA in the car. My mom always tells the story how she won her one and only radio contest when she was 20-years-old. The prize was an ABBA record and she has been obsessed with the catchy music since. ABBA originates from Sweden (yes, another amazing thing that has come from the country), and the museum is a place where you let go of all your inhibitions, dance to feel-good 70's music, and reminisce on the bands' glory days. If you're familiar with Mamma Mia, you'll know this album. The story of Mamma Mia was built around ABBA's music...that's how good they are. You absolutely can't miss this attraction if you're in Stockholm. 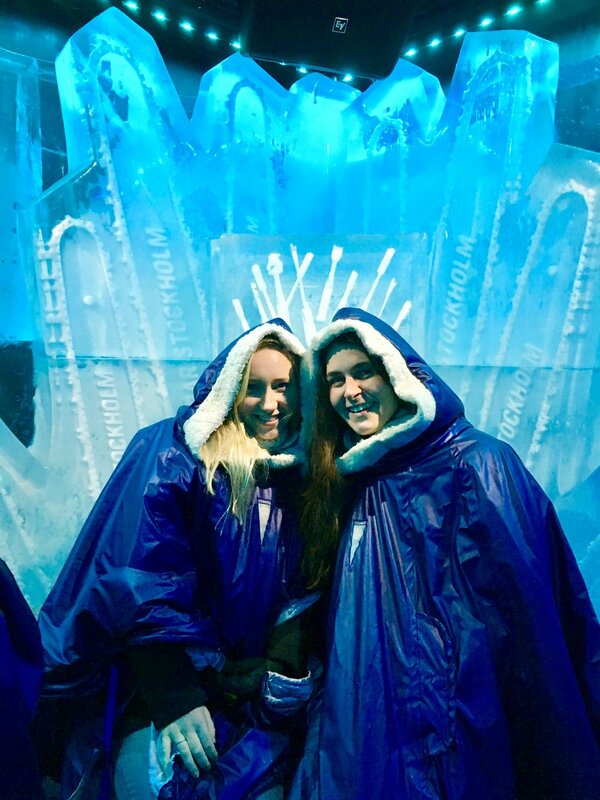 ICE Bar: This might be the most touristy thing to do, but I don't care. I wanted to go to an ICE Bar all throughout my travels in Europe and finally Bri was like, "Okay, when else are you going to be in Stockholm, Sweden?!" We booked tickets and were SO glad we did. It was the best way to end a full day in Stockholm. I'm pretty sure it was colder outside than in the ice bar, but at least we were pretty adjusted to the cold! Reserve in advance here. We were only in Stockholm for two days. During my first visit I did not get any form of transportation pass and in hindsight, that got very expensive. My AirBnB host this time around recommended that I get the 72-hour pass (there's no 48-hour pass) and it was our saving grace. We really enjoyed not having to pay for each trip or worrying about making smart moves around the city to prevent from blowing a ton of money on buses or trains. If you're arriving to Arlanda Airport, I highly recommend taking the 583 bus to Märsta Commuter Train Station and then transferring to the commuter train. This is important because if you take the train directly from the airport, there's a $20 tax added to your ticket. You can totally avoid that by taking the 583 bus for just an extra 10-15 minutes. I made this mistake during my first trip and took the Arlanda Express which was a $50 ticket. The Arlanda Express is totally different from the commuter train! When I found out I could've avoided that cost, I was so upset! The 72-hour pass ended up being $28 for unlimited travel. It's by far the best way to go! You can purchase this ticket at the tourist desk when you exit baggage claim. I stayed in Solna both visits in Stockholm. Staying in the center of Stockholm or Gamla Stan is basically impossible unless you want to spend hundreds of dollars a night. There are also a few hostels if you're interested in that option. Both hosts were wonderful and I highly recommend them. Option 1: Gunilla is the sweetest host and she made me feel so at home. I met her granddaughter who was training to be a dancer and she said her dream was to go to New York! Her apartment is located right next to the Mall of Scandinavia. It's super easy to access the center city since the major train line is practically outside of the building! Option 2: Willian was also an excellent host. His apartment is close to a metro station and you can be to the center city in less than 20 minutes. Not signed up for AirBnB yet? Click this link and get $40 of travel credit! My biggest piece of advice is to do the conversion rate before you purchase something. During my first visit, I purchased a sandwich and a coffee for $30, yes $30. It was absurd and I was too embarrassed to take the second to check what it would cost in USD. Sweden and really any Scandinavian country is very expensive and it's worth scouting out a place with decent prices. On the topic of money: I didn't exchange any cash for my time in Sweden. They use cards for everything. I know in some countries, there's a credit card minimum, but they almost prefer for you to use a card, even if you're just getting a coffee. If you pay in Euros (yes, most places you can), they will only be able to give you change in Swedish krona. So that's a good way to get some pocket change. You must try Swedish meatballs! Most restaurants in Gamla Stan serve them and they're delicious! If you're feeling risky, most restaurants also serve reindeer, but I really couldn't get myself to eat Rudolf. Pack warm clothes. I was so under prepared during my first trip. I just didn't pack enough warm clothing and I definitely paid for it. That ended up reducing the amount of fun I had. If you're bundled up and ready to face the cold, you will have an amazing time.